The MT door operator is designed for use on standard lift sectional doors up to 14 ft. high and up to 12 cycles per hour. High-strength dual L-rail track with exclusive nylon quiet gliding chain guides on rail spacers for quiet, smooth operation. 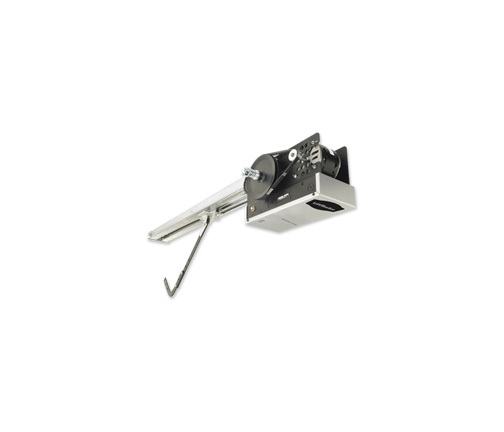 Includes quick-mount header bracket which provides fast, swing-up installation. Programmable C2 or B2 wiring options (B2 requires installed Monitored Equipment Protection Device) to meet business requirements for commercial door operator control. Powerful high-starting torque ½ HP, single-phase motor with internal automatic reset thermal overload is removable without affecting limit switch settings. Adjustable friction clutch helps protect against major damage to door and operator should the door meet and obstruction. Drive Reduction: First stage heavy-duty 4L V-belt; second stage and third stages #48 chain. Integrated 90-second maximum run timer. Heavy-duty solenoid actuated brake standard on model BMT5011U. NEMA 1 type electrical box, heavy-duty 11-gauge steel frame with durable powder-coated finish, all reduction sprockets drilled and pinned to shafts. Operator/Motor Control: Solid-State Medium-Duty circuit board. 3-button station for OPEN/CLOSE/STOP functions is standard for all door operators. Built-in 3-channel, 315 MHz radio receiver accepts up to (20) LiftMaster® Security+ or unlimited DIP switch remote controls. 3-button remote controls can be programmed for OPEN/CLOSE/STOP operation. Integrated Timer-to-Close (TTC) for timed automatic door closure after the door reaches the full open position for added security and peace of mind. Programmable from 5-60 seconds in 5-second increments. LiftMaster Commercial Door Operators comply with UL 325 standards for Monitored Entrapment Protection. NOTE: On steel-insulated doors, a 24 ga. back panel is assumed. Maximum recommended duty cycle: 12 cycles per hour.